If you’re looking for honesty, not all countries are alike. 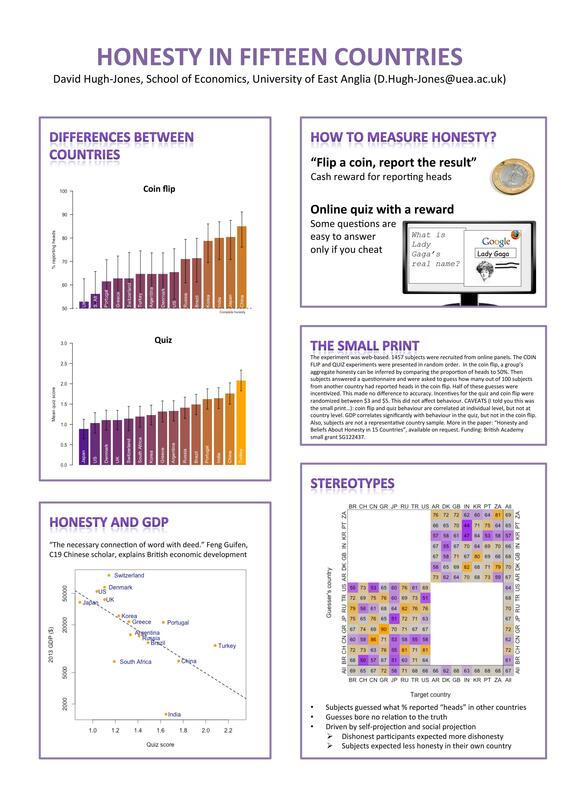 David Hugh-Jones, senior lecturer in economics at University of East Anglia, explains his research into honesty across cultures. David Hugh-Jones is a Senior Lecturer at the School of Economics. He holds a PhD in Government from the University of Essex where he was based as a Lecturer in the Department of Government before joining UEA. His research interests include Experimental Economics, the Economics of Conflict and Public Economics. He has published his work in top journals in Economics (like Games and Economic Behavior) and Political Science (like the Journal of Conflict Resolution). David is the PI of an ESRC Research Grant on “The norm of honesty: empirical studies on school pupils and the UK population”. The scandal underscores the social importance of honesty. We all need business partners we can trust, and products that perform as promised. But are there differences in honesty between countries? To find out, I ran two online experiments on people from fifteen countries, from Argentina to Switzerland. First, my subjects flipped a coin. They got a cash reward if they got heads. On the internet, nobody knows if you’re a dog, or which way your coin really came up. But if 90 out of 100 people in a country reported heads, it’s unlikely that all of them are telling the truth. Second, subjects took a quiz, again for a cash reward. Some questions were a little tricky. Do you know when Debussy was born? Nor do I. But either of us can find out by typing his name into Google. Of course, that would be cheating. Results showed big differences between countries. For example, in Great Britain about half of my subjects indeed reported flipping “heads”. In China, more than 80% did. Some people in all countries got high scores on those suspiciously difficult questions, but again, there were big differences between countries. But are these differences the ones that you would expect? Perhaps not. I asked participants to guess how people from different countries would behave. Everyone thought that Greek people would report a lot of heads. Even the Greeks thought so! In fact, Greeks were no different in honesty to other European countries. The point is not to wave the flag. Instead, those of us in countries where people can generally be trusted should be aware that we are lucky. Much of the world looks different.